Sometimes, you might need to raise an invoice for a particular percentage or straight dollar figure of the opportunity. For example, you might take 50% of an opportunity or $200 up front to secure booking. Use part invoicing to do this. 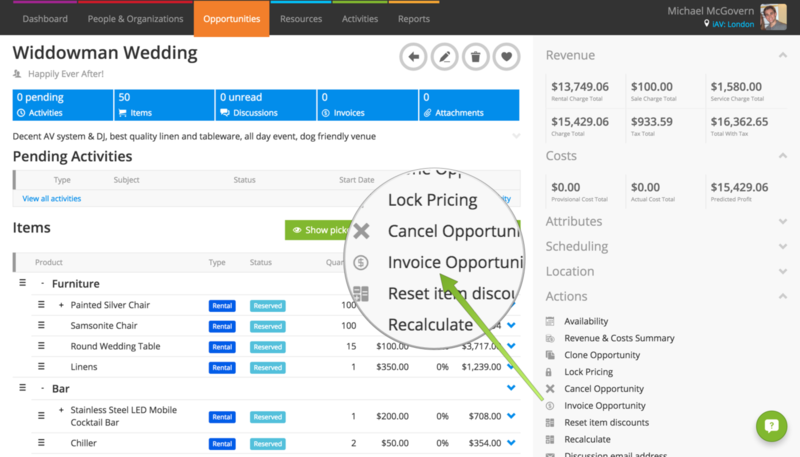 From an opportunity at order stage, click Invoice Opportunity under Actions to bring up the Invoice Options pop-up. For Invoice Type, choose “Part invoice” and pop in either the percentage you’d like to invoice or the invoice amount. 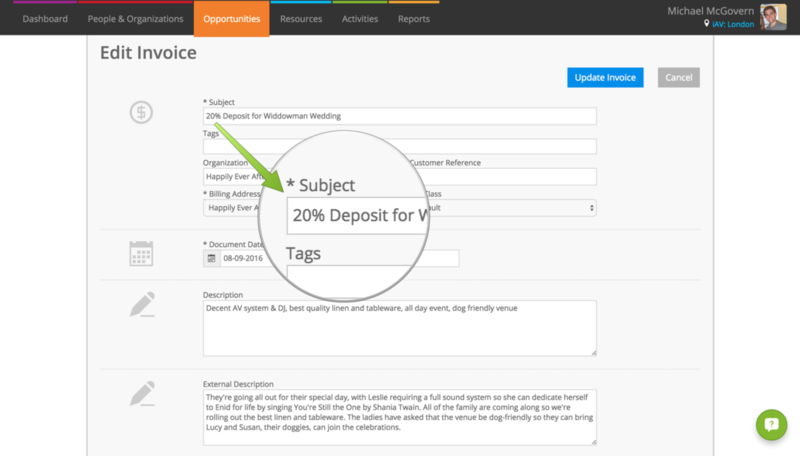 If you choose percentage, Current will automatically calculate the invoice amount in the box at the bottom. Hit Create and a one-line invoice for that amount will be created for you. 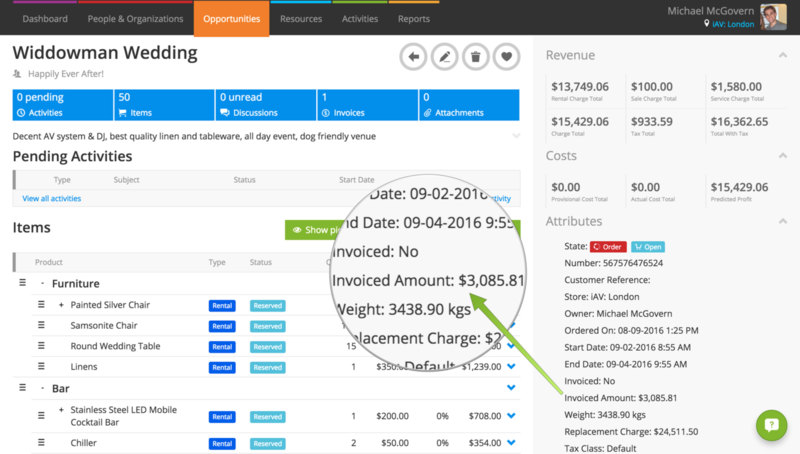 Grouping options are not used when creating a part invoice, a one line invoice is created for the invoice amount. Like standard invoices, part invoices are a snapshot of the opportunity or project at the time you created the invoice. It’s a separate record in Current, so changes to the opportunity or project aren’t automatically reflected on the invoice. The snapshot approach is great for events where numbers and products change a lot; if you raise a 50% invoice now and prices on the opportunity change, the amount you’ve taken won’t be 50% any more but you’ll be able to raise a final invoice less the amount you’ve taken. Edit the invoice using the pencil icon at the top and amend the “Subject” field. For example, you might specify this is a deposit for the opportunity. 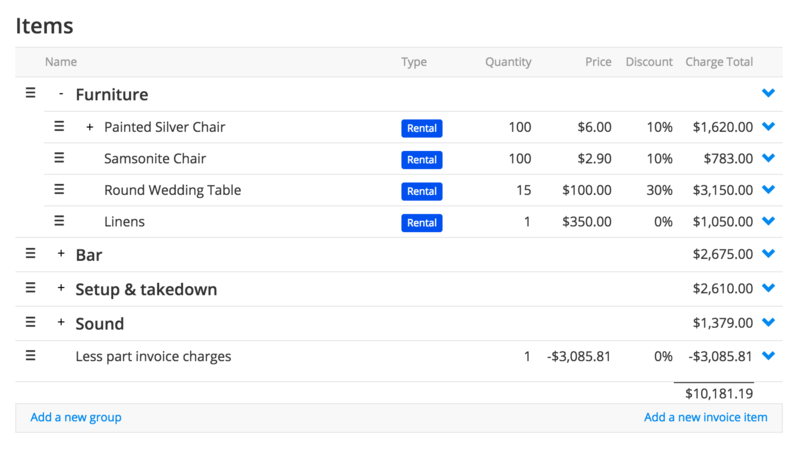 Edit the invoice item by clicking or tapping the blue arrow next to it in the items list, then pop in some text in the “Description” field. Some companies use this to provide further information about this invoice. If you amend the price of the line created as part of the part invoice process, this will adjust the amount that’s been part invoiced on the opportunity. If you add additional lines to a part invoice, that amount isn’t included in the amount that’s part invoiced. When you’re happy, you can issue the invoice, print any documents, or post to a cloud-based accounting package as normal. Some companies might need to raise more than one part invoice. For example, you might take 50% to secure a booking, then 25% six weeks prior to the event, followed by the balance one week before. To create another part invoice, follow the process above and specify the percentage or total you’d like to take. You’ll see all of the part invoices you’ve created on the left hand side of the opportunity or project under the Invoices heading. When you create a part invoice, the opportunity isn’t marked as invoiced as it’s not fully invoiced. 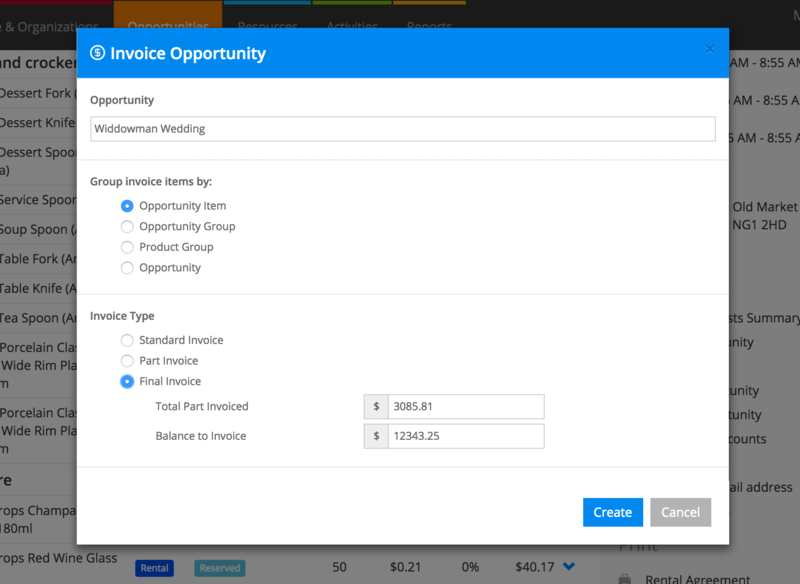 The “Invoiced Amount” figure on the details pane gives you an overview of how much you’ve invoiced already across all invoices on the opportunity, including part invoices. 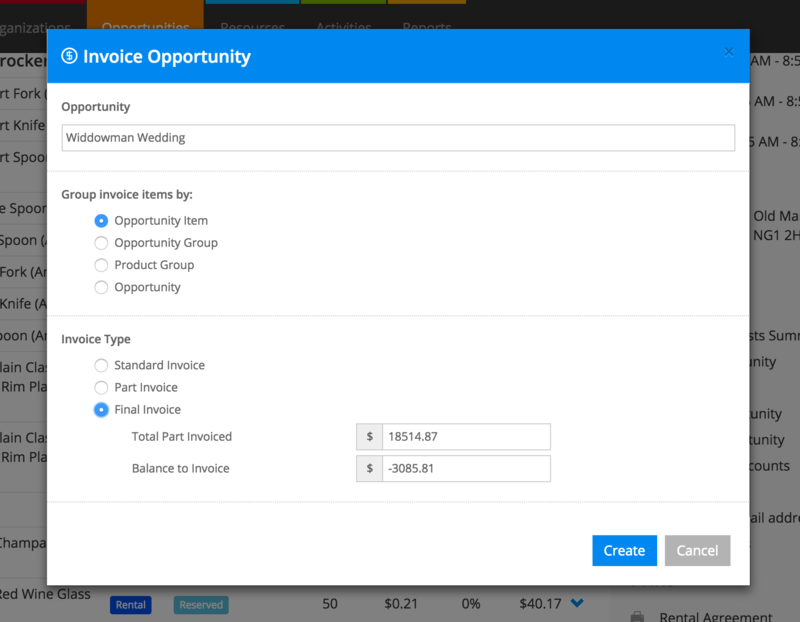 When you’re ready to create a final invoice, open your Invoice Options pop-up by clicking Invoice Opportunity from the opportunity. Choose “Final invoice” as the Invoice Type. Current will let you know how much that you’ve part invoiced and the balance to invoice. Hit Create and Current will automatically take you to the new balance invoice. Depending on your grouping options, you’ll see lines for your opportunity items, opportunity groups, product groups, or opportunity plus a line to deduct the total any part invoices received so far. The line that deducts any part invoice charges is called “Less part invoice charges” by default, but you can change this in System Preferences. When you’re happy, issue the invoice, print any documents, or post to a cloud-based accounting package as normal. It’s really important to generate a final invoice because final invoices are used for revenue reporting. What if I've part invoiced more than the balance? Current will let you know that there’s the amount to invoice on your balance invoice is a negative number and you won’t be able to generate an invoice. Void or credit some part invoices in order to raise a final or standard invoice. How do I change the tax and revenue group on my part invoice lines? To choose the tax class and revenue group used on your part invoices, head to System Preferences. The same tax class and revenue group is used for your one-line part invoices and “Less part invoice charges” deduction line, meaning everything should add up. I issued a part invoice but the figures aren’t reflected in my reports, why? Part invoices are not used for revenue reporting; the final invoice is used. You can think of the part invoice like a request for a deposit i.e. just an amount of money that has no direct relationship with the individual products on the opportunity. When you produce a final invoice, that revenue is then considered to have a relationship with the items and is apportioned to your reports.